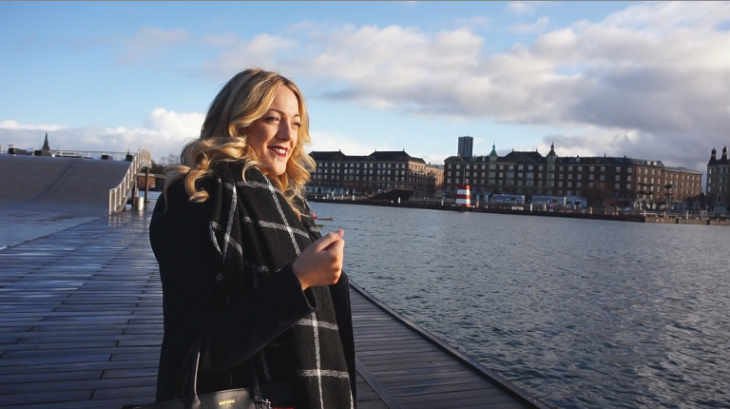 I recently went on a three day trip to Copenhagen as a birthday & Christmas present from my sister & mum, I thought I would share some of my favourite photos & tell you what I thought of Copenhagen & what I got up to. 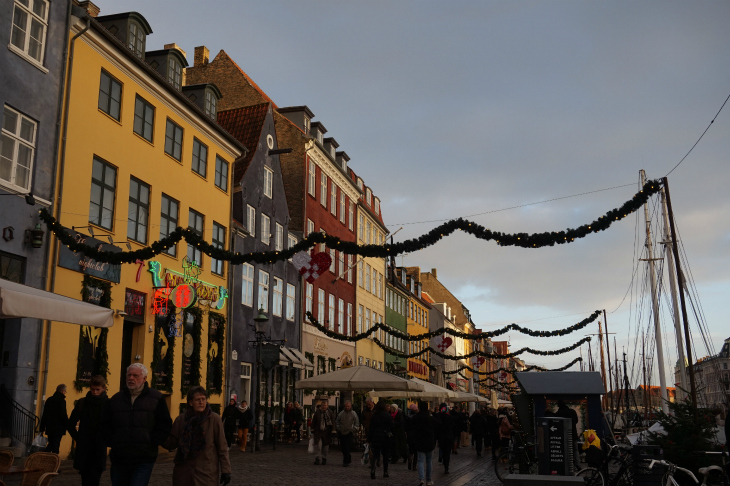 The reason we went to Copenhagen was to get into the Christmas spirit & to explore a new city. We visited all the Christmas markets & I finally tried mulled wine or as they like to call it Glögg, an it was really yummy. We also ate lots of Danish pastries. 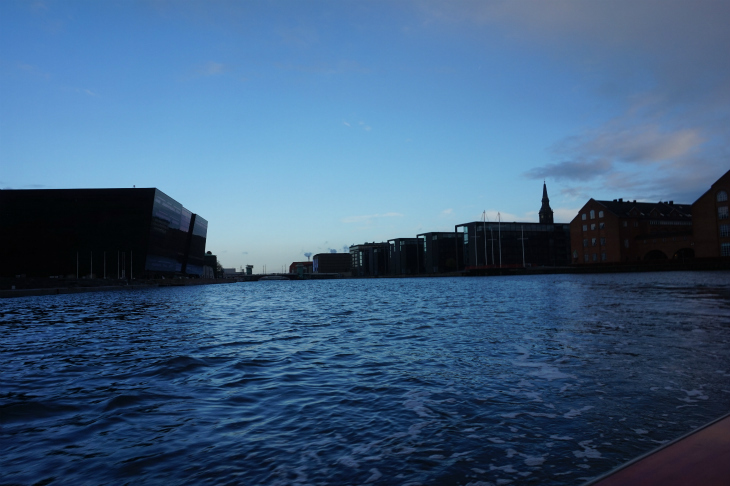 We were wondering around Copenhagen one day & came across a boat tour through the canals, the price was amazing & we thought it would be a nice way to see more of the city & learn more about the history of Copenhagen. Even though it was a cold wet day we really enjoyed ourselves, we got to see The Little Mermaid which was on the top of my list to do. 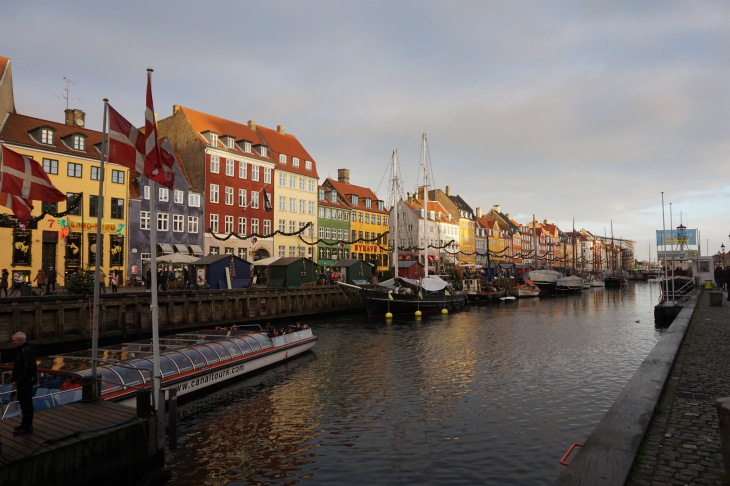 I went to Copenhagen with my older sister; my flights there were a birthday gift from her & my hotel was a gift from my mum. It was nice to spend some sisterly time together as we rarely get to see each other much. 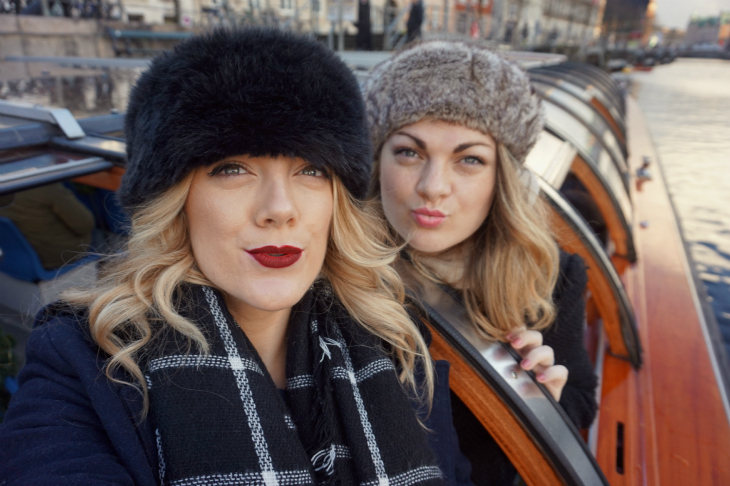 While we were away I filmed two videos, I filmed a lookbook for my main channel & a lovely vlog for my vlog channel. You can find my lookbook here & my vlog here. 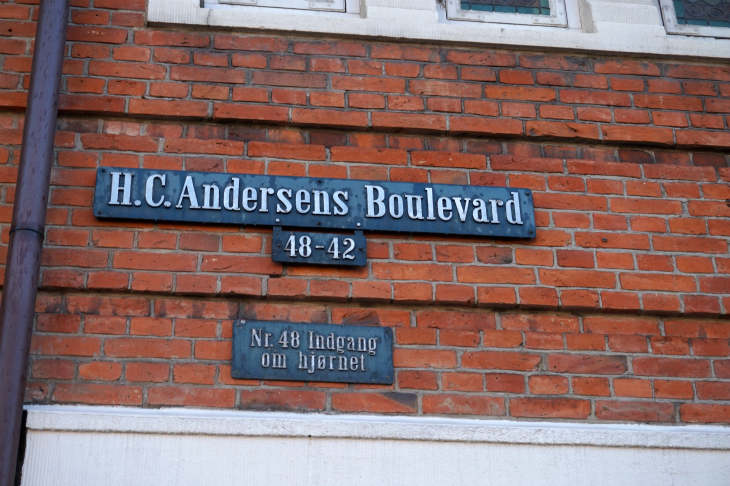 On our first day we wandered around the streets of Copenhagen explore little roads with cute apartments on them. 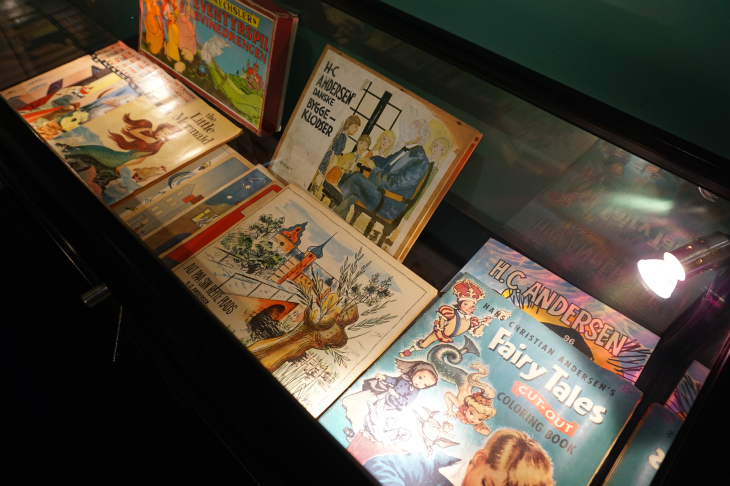 When we first arrived to Copenhagen we dropped our bags off at our hotel (Which I will be reviewing soon) an we went off on a search for the Hans Christian Anderson museum. We both wanted to go here as of course he wrote so many classic fairy tales & we wanted to find out more about him as a person. Once we was inside you really forgot how many fairy tales he actually wrote. It’s made me want to collect all his books ready for when I have children. 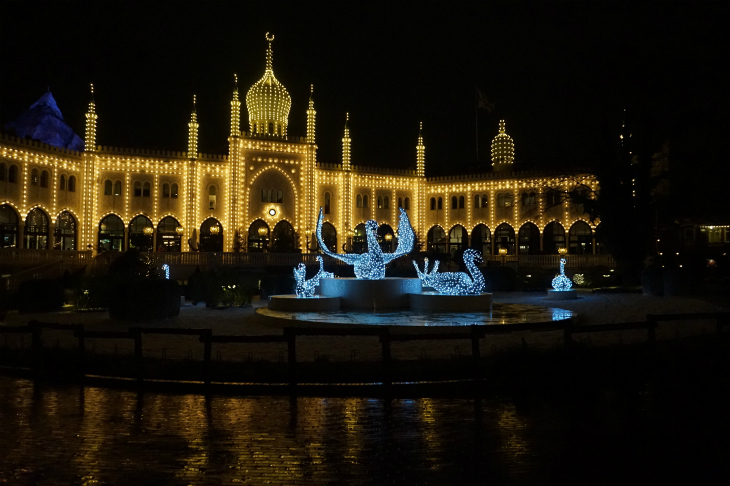 We went to Tivoli gardens, my dad had spoken about going here as a teen on a school trip one year & said we should go give it a look, so one evening we got all wrapped up & wandered around Tivoli gardens to get into the Christmas spirit. 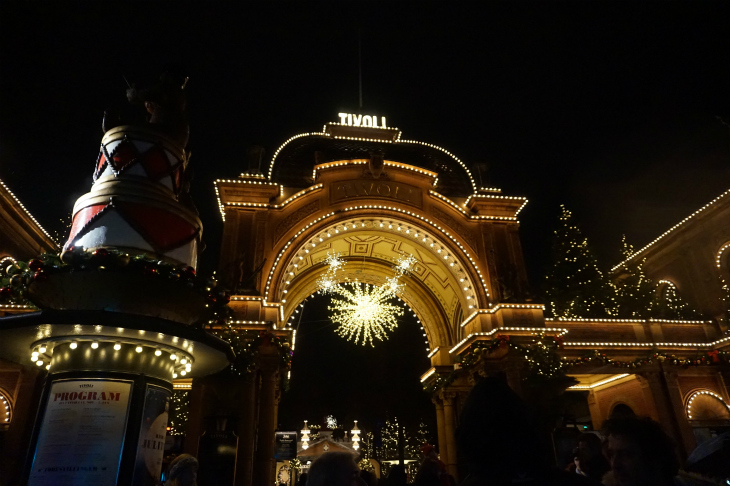 Tivoli gardens is an amusement park & around Christmas time also has a Christmas market. You can buy tickets to just go inside or buy tickets for all the rides as well, I’m not a big fan on rides & neither was my sister so we decided to just wander around the park. For me personally the park is beautiful with all the lights everywhere but I found the market to be a little rubbish, they literally had about 10 stalls & that was it. Once you looked around the park & at all the lights it just seemed pointless hanging around as lots of the shops & food places in the park were closed even though it was only 8pm. I would say go if you like rides but there’s no point going if you don’t as you can pretty much see all the lights from the outside. A few weeks ago I made a trip to Reds True BBQ with my sister. 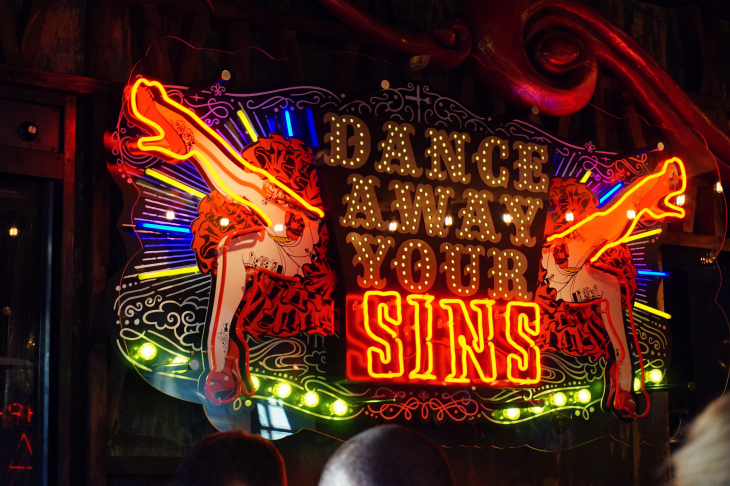 I heard about this place through a programme on ITV called BBQ Champs. 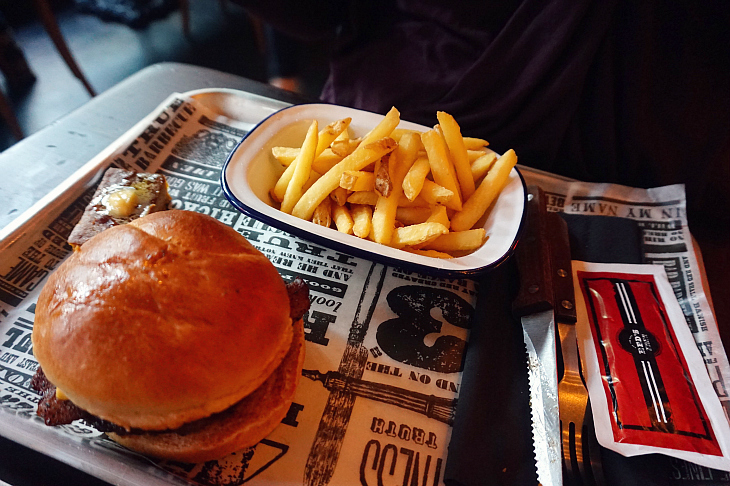 Now myself & my sister love a good burger and I also love ribs, so this was the perfect place for us to try one Friday night as we were heading out in Shoreditch that night away. 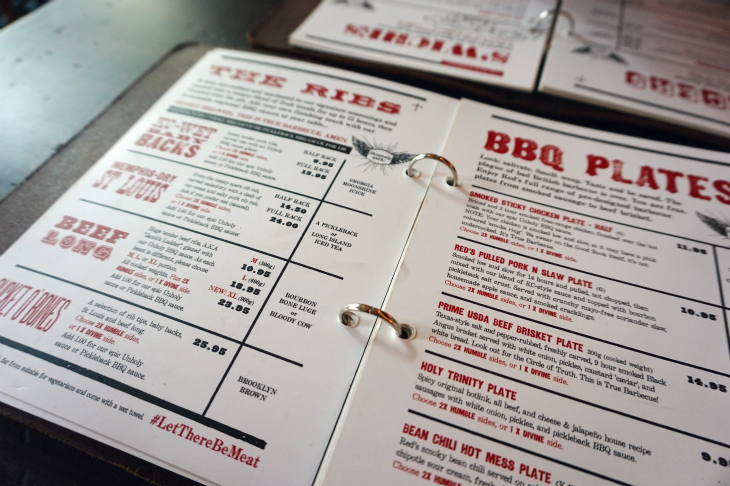 The menu is full of mouth-watering things, I recommend having a look at their menu online first to get a little idea of what you like, same with their drinks menu as well. On arrival to Reds we were greeted by a lovely member of staff & she explained how Reds worked, they cook everything hours before hand as all the meat is slow cooked, this means that some items may not be available when you arrive. Luckily for us the only thing not available was burnt ends. We decided to get a drink while we looked over at the menu. I picked a fun cocktail as I was celebrating my one year youtube anniversary. It was hard to pick a cocktail as they had so many great ones. 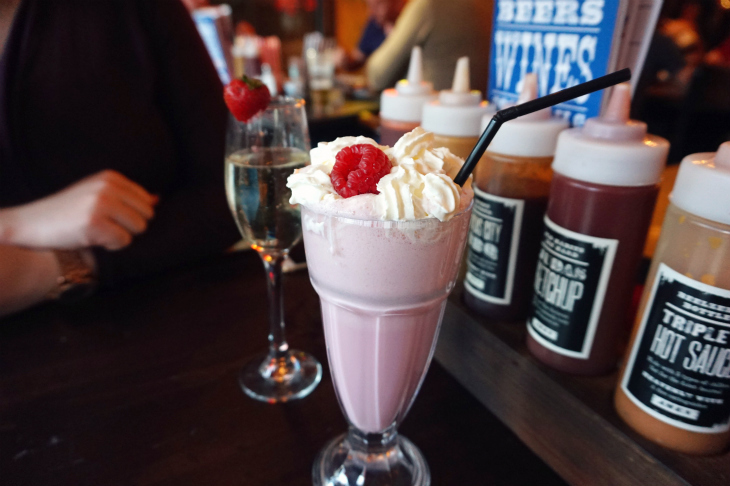 In the end I went for Raspberry Ripple, this is a blend of Vodka, Ice cream & frozen raspberries it was then topped with whipped cream. If you’re going to order this great I recommend stirring it every time before you drink it, the vodka settled to the bottom a little but apart from that the cocktail was great & very strong. After we got our drinks we ordered our food I picked the Memphis Dry St Louis Ribs (Pork Spare Ribs), I had sweet potato fries & shared a piece of cornbread with my sister. I got half a rack of ribs an oh my when they came I was surprised, they had to be the biggest half rack I’ve ever seen. I chose to keep them dry but you can ask to have them wet (sauce added before being served). The meat was cooked so well that I could literally pull it off the bone, it was still really moist & juicy even though it had been slow cooked for hours. I’ve tried St Louis ribs elsewhere & Reds have to be the best I’ve had not just for quality but for size & price. My sweet potato fries where great as well. I tried a couple of Reds sauces they have, I tried there ketchup & one of the BBQ sauces, I have to say the ketchup was my favourite were as my sister favoured the BBQ sauce more. 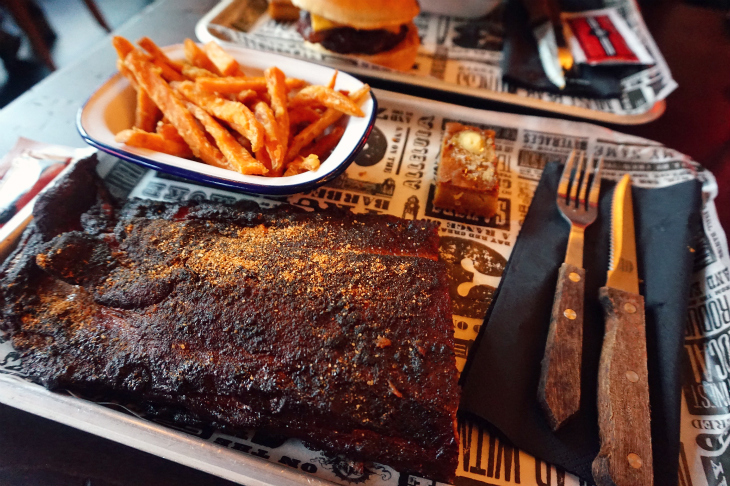 For half a rack of Memphis Dry St Louis Ribs & two humble sides cost £14.50. Now I’m going to say something that a lot of Americans may hate but we decided to try the cornbread as we have never had it before & I have to say I was very disappointed with it both me & my sister said that it didn’t really have much taste to it & it also felt very stodgy like it wasn’t cooked right. 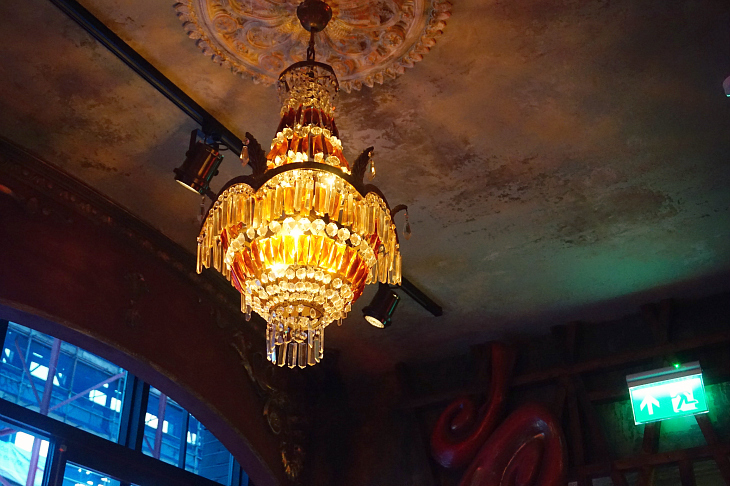 The décor in Reds is very run down burlesque joint back in the day, with the mismatched chandeliers, chipped wall paint & red signs all over the place. 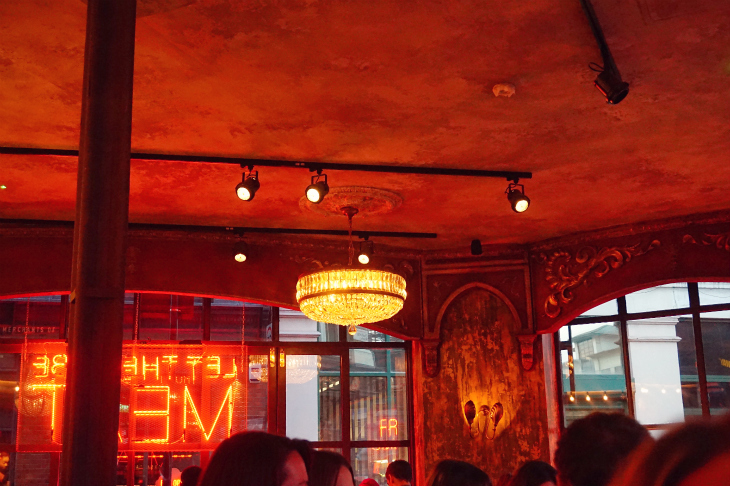 I loved the décor of Reds I thought the mismatched chandeliers was a great idea as it makes you look around the rest of the restaurant to see the others, which also made you look at what others had ordered. The guy’s next to us ordered the Donut Burger, yes you read that right DONUT BURGER. It looked great but also at the same looked like a challenge you would have seen on Man v Food back in the day. Now on to the highlight of the night, our food was great an we were just going to get the bill till we had a little look at the dessert menu. 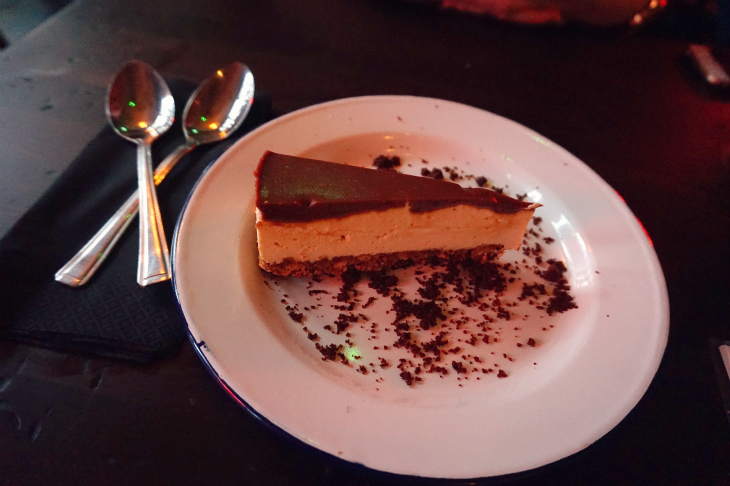 We spotted Chocolate Peanut Butter Cheesecake this had to be the best dessert on the menu & we just had to try it. We decided to share a slice & we both wished after it came we ordered one each. The best thing about it was the fact it wasn’t an over powering peanut butter taste but it also wasn’t one where you couldn’t really taste it either. I have to say Reds got the balance just right with this dessert. Last weekend my mum & I threw a little garden party for our friends & family. It was partly for my birthday & just to have everyone round. The lovely Lea from SincerelyShug & Sarah from SRFTaylor joined the party, armed with presents & wine for me & my mum. 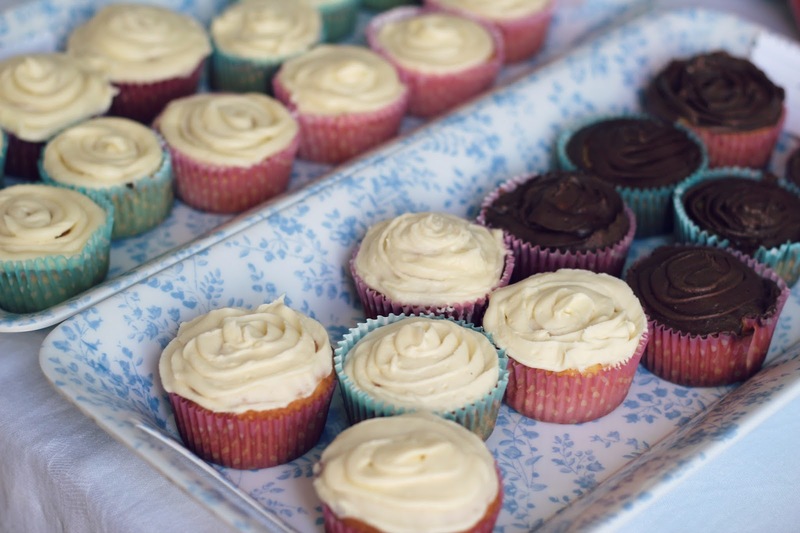 My mum & I baked lots of treats. I made my chocolate cookies that everyone loves & my mum made lots of little cupcakes & all of them have different flavored icing. My drink of choice at the party was LBD (Little Black Dress) Lime & Watermelon vodka. This stuff is amazing, I picked this up in Asda for just under £10 & it’s a low calorie vodka. It has half the amount of calories compared to normal vodka but LBD has a great fruit taste. 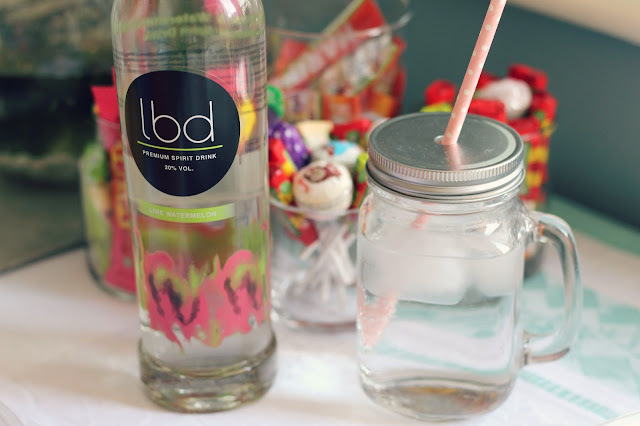 I paired this vodka with diet lemonade for the perfect guilt free drink. An of course I had to use my mason jar & cute pink paper straw. 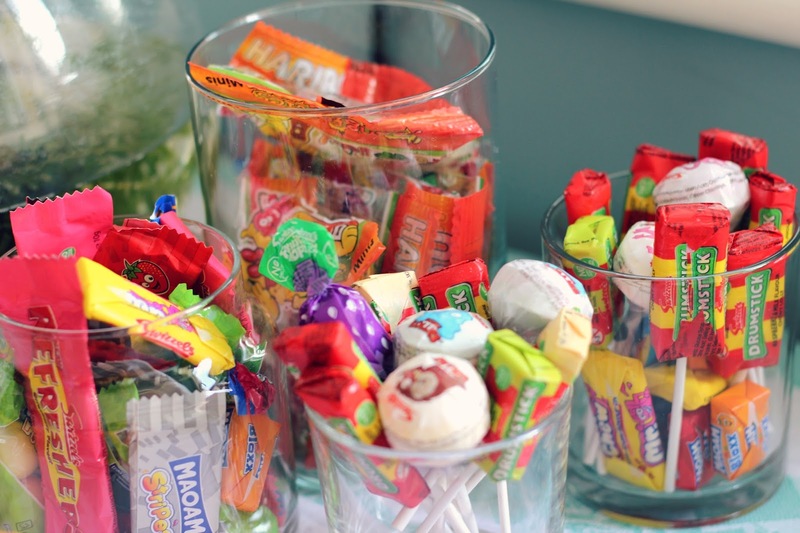 I also made a small sweet station at the side of the table as I’m a big sweet tooth & so are the rest of my family. I picked some of my favourite wrapped sweets. I picked wrapped sweets as this made it easier for everyone to grab them & also meant no germs. 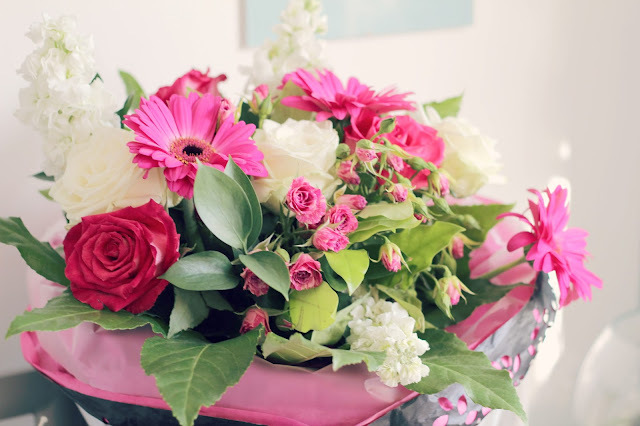 To finish the table off we had lots of food & drink an of course some pretty flowers. It wouldn’t be a garden party without a big bunch of flowers. I thought I would start doing a new segment on my blog. I’m trying to eat a lot better & I know a lot of others are to so I thought a weekly/bi weekly What I Ate Today post would be great to inspire others & also keep me on track of eating well. I call this The Healthy Apple Crumble. 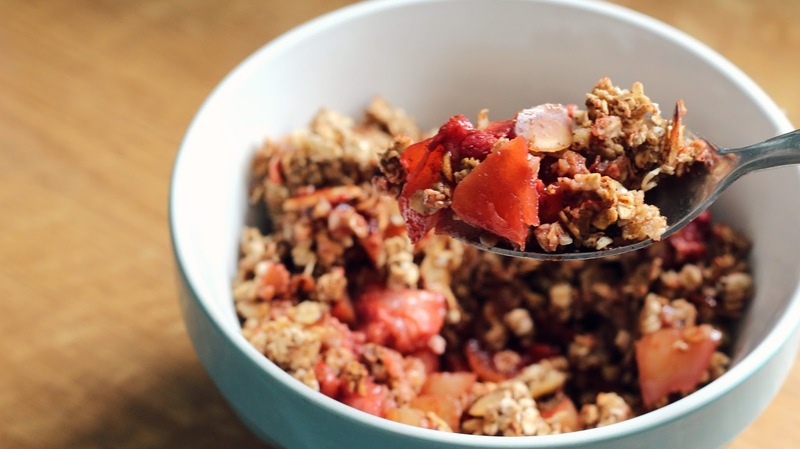 This is basically a crumble but with no sugar or flour. I cut up about two small apples; I like to leave the skin on. I also added strawberries to this, you can add any other fruit you think works in a crumble. To the fruit I added mixed spice & baled in the oven until the apples went soft. 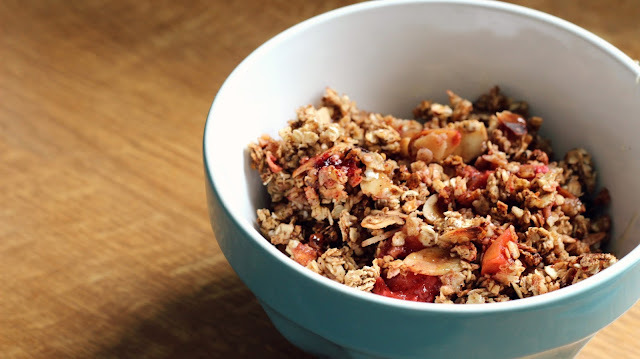 For the crumble topping I took oats, mixed spice, flaked almonds & a dash of almond milk. 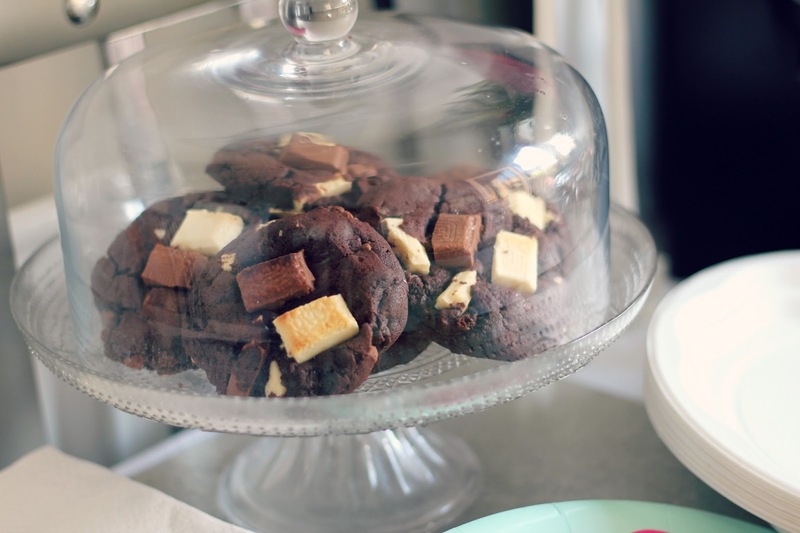 I mixed all this together & baked this on a separate tray. When everything is ready I place the fruit in a bowl & top with the crumble, I sometimes add a little honey for some sweetness. If I’m doing stuff for my blog or youtube channel I forget about lunch quite a bit, so when I do remember I try & make something that’s quick, easy & tasty. 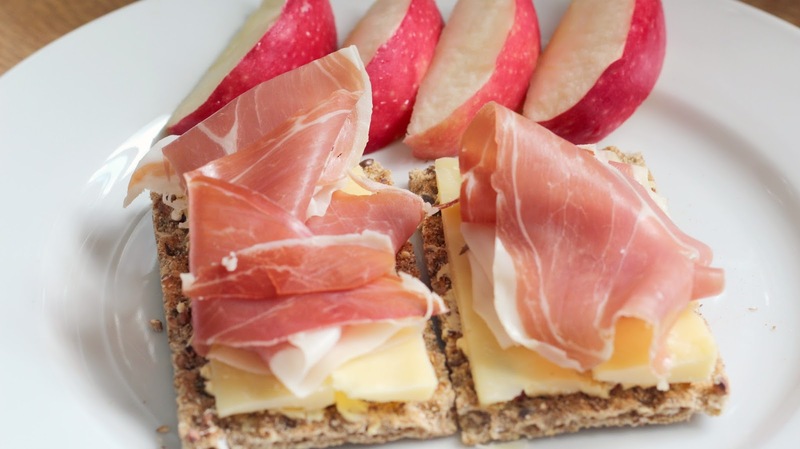 The easiest thing I make which also is super tasty is wholegrain ryvitas with extra mature cheese topped with parma ham. I also like to have some fruit on the side & my go to at the moment is a big pink lady apple. Dinner is one of my favourite meals of the day. I love to play around with food & create new dinners. 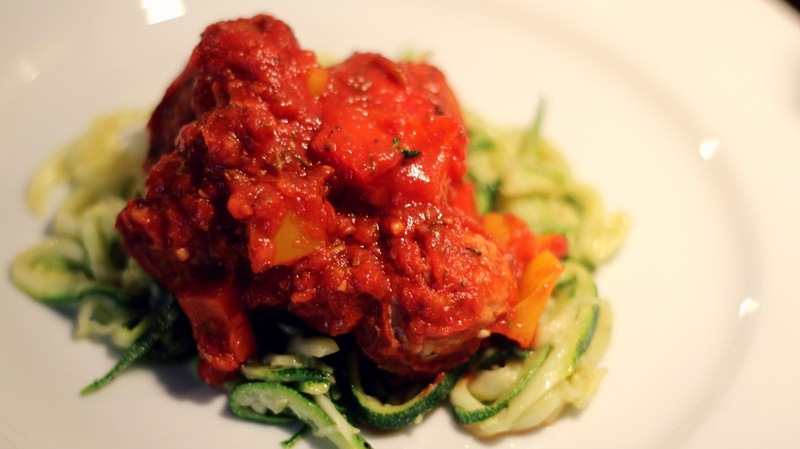 I decided to give courgette spaghetti ago; I bought a cheap spiralizer off eBay & used one courgette for my spaghetti. I cooked this in a pan with a little bit of oil. The topping for my spaghetti was passata with a mixture of herbs & chunks of red & yellow peppers. I also had quorn meatballs as I don’t eat meat at home much. This dish was low in calories & really tasty. I’m not one to change up my skincare much especially if I’ve found some that works well for me but after I came back from my holiday in June I revamped part of my skincare & fell more in love with a few old newbies from a few months before. Let’s start off with the products I’ve had for the longest. This have to be my Mario Badescu products, I picked these up back in May after I start to run out of my then loved Pixi Glow tonic. I want another exfoliating toner but that was easier for me to get & with a better price tag. I found about Mario Badescu quite a long time ago when my acne was still bad but I never braved trying anything. I was only reminded of the brand when I was doing an online search for an exfoliating toner. The Glycolic Acid Toner only has 4 ingredients compared to the Pixi Glow Tonic which has 19 ingredients. The ingredients in the Glycolic Acid Toner are water, aloe gel, grapefruit extract & glycolic acid. This toner is great for anyone that suffers from scarring as it helps reduce the discolouration of scars & it’s also helps to keep the looking more vibrant an less congested. This product cost £15.50 for 236ml or £26.50 for 455ml. The next Mario Badescu product is the Facial Spray with Aloe, Herbs & Rose Water. This is a great product to add moisture back into the skin. I like to use this during the day when I’m wearing no makeup to give my skin a little boost & to feel refreshed. It’s also great to use after your face cream & it states that you can use this as a makeup setter & a hair mist, I haven’t tried either of these but I can imagine your hair smelling great if this was misted over your hair. Onto the smell because the spray has rose water this really reminds me of turkish delight, I love this smell. This product cost £5.95 for 4oz or £10.25 for 8oz. Let’s move onto the products I bought after my holiday, firstly I bought these as I need more soothing & hydrating products as I got a little burnt on holiday, I clearly didn’t listen to my Sun Protection 101 tips. 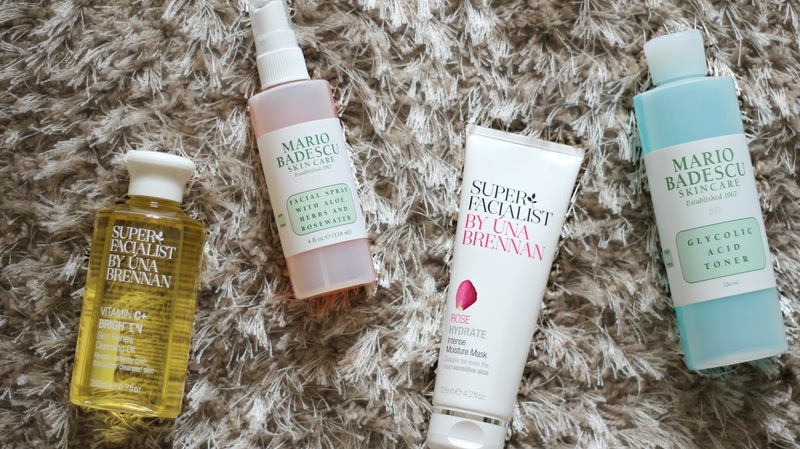 I’ve always heard good things are the Super Facialist by Una Brennan range, so I thought that would be my best bet to try & find some new products that I know will work with my skin. The first thing I picked up was the Vitamin C+ Brighten Cleansing Oil. I had never used cleansing oil till I went on holiday & picked up a mini of the Mac Cleanse Off Oil (Which is amazing). Since I loved the Mac cleanser so much I thought I would try a more purse friendly cleansing oil. The Skin Renew Cleansing Oil is infused with Vitamin C, Olive, Grapeseed & Rosehip oils. This cleansing oil also has Rosemary oil, Vitamin E & Cucumber oil in it. This starts off as an oil but once water makes contact with it, it turns into a milky cleanser. I find this removes my makeup a lot faster & easier than my previous cleanser. This product cost£10.99 for 200ml. The Rose Hydrate Mask is a great 5 minute intense moisture mask. I like to use this ever week or so to add moisture back into my skin especially when it gets really dry or I’ve worn quite a bit of makeup that week. This mask has White Willow which enhances skin cell turn over, it also has Vitamin E & Urea with soothing marshmallow extract to hydrate, plump & replenish the skin. You use this for only 5 minutes & then wash off; you are left with incredibly soft skin. This product cost£9.99 for 125ml. Tuesday evening I was lucky enough to be invited to the Vichy press launch that was hosted at Rook + Raven. On arrival I was greeted by a lovely member of the Vichy staff & met up with Lea from SincerelyShug & Sarah from SRFTaylor. 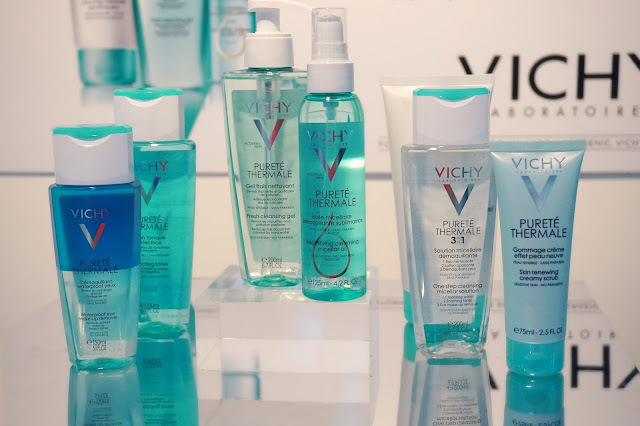 We got a walk through of all the products that Vichy has to offer, I’m already a big fan of their Normaderm range as this helped clear all my acne up in the past. After having our little tour of all the products we walked around & tested quite a few out. I must say my hand felt amazing at the end of the night. We got speaking to Dr Anjali Mahto who is Vichy’s Dermatologist on their expert panel. She was telling us about the benefits of starting a good anti-aging skincare routine in your early 20’s. 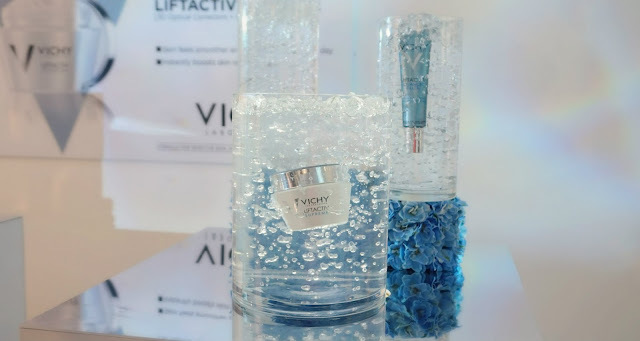 She spoke about the LiftActiv range, this range is targeted at people with deep wrinkles & loss of firmness but I personally think someone my age could benefit from at least two the of products DR Anjali Mahto told us about. The first product she recommended us to try was the Serum 10 for eyes & lashes, this serum is meant to illuminate & lift the eyes. You can also you this on your eyelashes to help strength them. The other product see recommended was Advanced Filler night cream; this has a high amount of retinol which is great to help smooth wrinkles. Serum 10 cost £24.50 for 15ml & Advanced Filler cost £31 for 30ml. 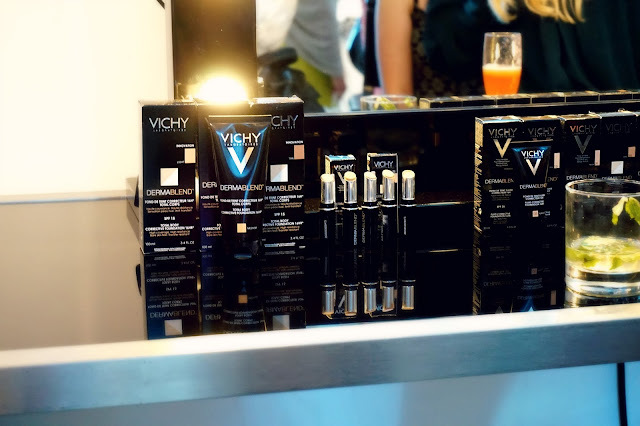 After a great evening of trying new products we popped to get coloured matched for Vichy’s well known foundation DermaBlend. 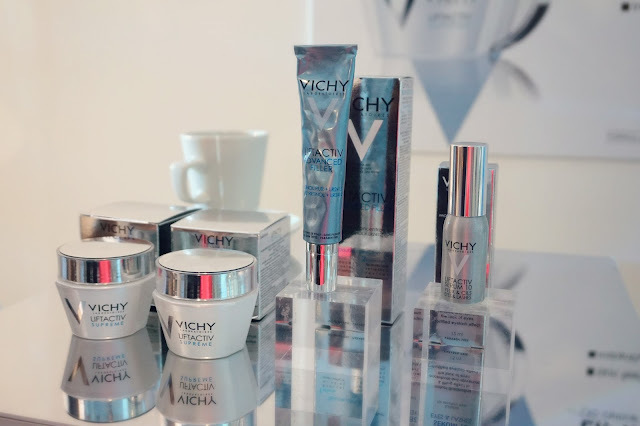 Vichy has brought out three new shades for the DermaBlend range, we now have Porcelain which is the lightest shade in the range & we also have Coffee & Espresso which are the two darkest shades on the range. 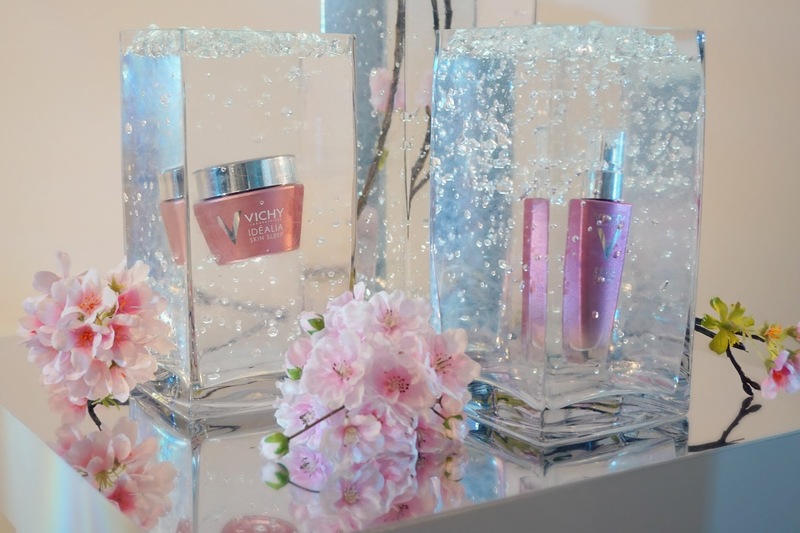 This is great that Vichy has brought out three new shades as this range now caters to more skin colours. I’ve always been a fan of the foundation; it’s a great high coverage foundation that’s very build able. I used this a lot when I suffered from acne. DermaBlend ranges costs from £15 to £29.50. Before we left the event I was lucky enough to pop to Vichy’s little pop up pharmacy where they had all the products for us to pick from. I was allowed to pick two products I wanted to try out as well as take home the Idealia Skin Sleep night cream & the perfect shade of the DermaBlend foundation. With the help from one of the lovely Vichy staff members I picked the LiftActiv Serum 10 & the Idealia Smoothing & Illuminating day cream. I will be testing all the product’s I was lucky enough to take home & will do a full review on everything. 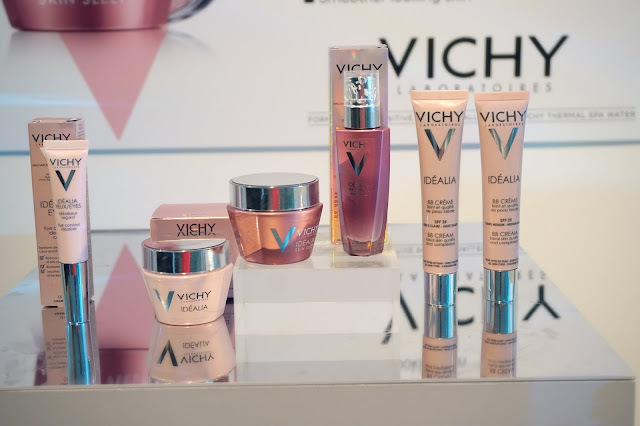 I would like to say thank you to Vichy for having me at their press event. As summer is now finally here I thought it would be fitting to do a post about sun protection. In the summer I do a lot of outdoor things. I enjoy watching cricket, sitting in a garden/park & this weather is perfect for long walks. All of these things need sun protection. 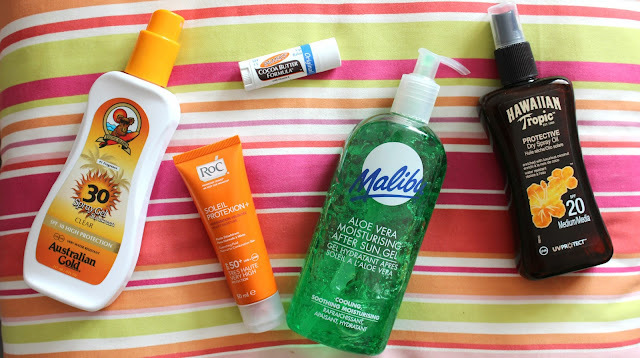 So today I’m going to talk about sun protection for your lips, face & body. One part of the body that a lot of people seem to forget about when it comes to sun protection is your lips. I won’t lie I have done this many times then wished I had remembered to put something on them. It’s hard to tell if your lips are damaged as they don’t go red as you would if you burnt the rest of the skin but I find they get a lot drier than usual if I haven’t used any protection. Best way to stop this happening to your lips is to use a lip balm with a SPF in. I personally like to use one that is still moisturizing for my lips. My favorite is Palmer’s Cocoa Butter Formula lip balm, this has a SPF 15. You can find lots of brands that do higher SPF’s in lip balms, Nivea have a sun protect but you can always layer the Palmer’s lip balm over the Nivea one for added moisture. Another part of the body that is over looked quite a lot when it comes to sun care is your face. So many think the SPF in there face creams in enough for the day but it isn’t its ok for the UK weather in the winter but in the summer our faces need more protection. When it comes to protecting my face from the sun I like to use a high factor & stay with this number. My favorite SPF for the face is Roc Soleil Protextion + SPF 50, I find this doesn’t break out my skin & it sinks in very quickly. I use this over my face cream as I don’t find it to be moisturizing but it’s a great face SPF. Another high factor SPF I’ve tried that is a little easier to get hold of but is a little pricier is La Roche-Posay Anthenlios XL SPF 50. I find the La Roche-Posay one to be a little thicker & it really doesn’t sink in as well, considering it costs more I was hoping it would be better but I find that the Roc one is the best. Both face SPF’s have UVA + UVB protection & a UVA star rating of 4. My biggest advice when it comes to sun protection for your body is to start off with a high factor. Our bodies aren’t in the sun all year round so we aren’t use to it like many other countries so I always recommended to everyone I know to start off with a SPF 50 & work your way down to the factor you are more than likely to use. I suggest going no lower than SPF 15, I only go down to a SPF 20. The reason I suggest starting off with a high factor is mostly because our skin isn’t use to the sun being that strong & it’s better to start off high & go lower then start off with a low factor an burning as your skin isn’t use to the sun or the low protection. I only suggest going lower if you are to get a tan; if you want protection & don’t really care about getting a tan then I suggest staying with a high factor like SPF 50. 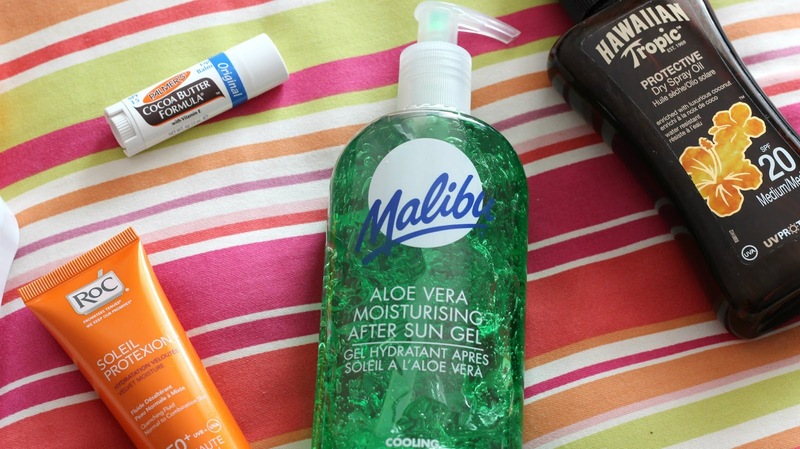 I use Malibu SPF 50 spray lotion to start when I’m exposed to the sun. This is a once a day cream but this means nothing really, I still suggest applying this every hour or so instead of every 8 hours which they suggest. If I’m trying to get a tan on holiday I will use this for the first few days but if I’m at home I will use this for the first few weeks on summer then work down to a lower SPF. This sun cream is a spray which I prefer as I find them easier to apply; it’s a thin liquid & sinks into the skin very quickly. This doesn’t have a strong sun cream smell which is nice. This sun cream contains Vitamin E, Aloe Vera & its water resistant (I still recommend apply straight after being in the water) This sun cream has UVA + UVB protection & a star rating of 4. 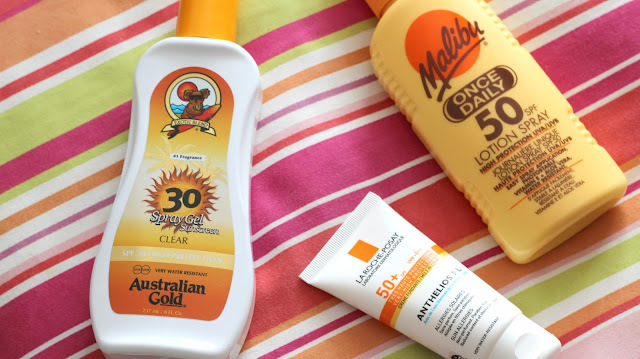 My go to SPF 30 is by Australian Gold. This claims to be a spray gel but it’s pretty much the same as the Malibu lotion spray. This sun cream contains sunflowers, tea tree & olive fruit oil which provides hydration that enhances the skins ability to achieve more of a tan. This also contains Vitamin E & Aloe Vera. I use this sun cream for a few days as it has no star rating which means it doesn’t protect against UVA + UVB as well as others that would have the star rating. This sun cream has a really nice fruity smell. My last sun cream is for when I want a tan. This is what I use most of the summer. Hawaiian Tropic is my favorite brand & there Protective Dry Spray oil is the best, I have this in SPF 20 + 10. I don’t really use the 10 unless I’m in the sun for only a little bit & that’s right near the end of summer. This sun cream is recommended by the Skin Cancer Foundation as an effective sun cream. It’s enriched with coconut which gives it an amazing fruity holiday smell. The oil doesn’t skin in straight away so this is good if you plan to wear it when you’re wearing clothes but if you are in your garden or by a pool this is a great sun cream. This sun cream has UVA + UVB protection & a star rating of 3. Lastly I always suggest using Aloe Vera gel after being in the sun. I suggest taking a look at the NHS site on sun protection as well & Skin Cancer Foundation. I would always recommend discussing sun protection further with your GP. I was recently contacted by Vita Liberata and asked if I wanted to try out their sister range NKD SKN, I jumped at the chance as I'm already a fan of the original range. They are also offering my readers a 45% discount off the NKD SKN range. There collection consists of Tinted Tan Mousse in Medium & Dark, Matte Wash Off Instant Tan in Medium & Dark & Tinted Tan Liquid in Dark. The application was very easy with this tan, The mousse glided on and blended very easily. Once applied I noticed how quickly it dried, I was able to get dress straight after. I love that it is odorless so no worrying about smelling like fake tan. The best thing about this self tan is the fact it lasts up to 7 days with one application and fades like a natural patch free tan so no one would even be able to tell its from a bottle. I was sent the shade Medium and I think this is my perfect shade, it looks very natural on me and doesn't have that horrible orange tint to it like other self tans do. I'm a big fan of wash off instant tans, I like the idea of popping a bot of color on for certain occasions and not having to worry about having it for a whole week or trying to scrub it off. These give you the same color pay off but theirs no commitment to having to wear it. These are odorless, feels like you have nothing off and wash off instantly in the shower. I've never tried a liquid tan before but it sounds great for the summer time. This gives you that deep holiday tan look, so if you want to fake a beach tan this is the one for you. This dries instantly, odorless and lasts up to 7 days.